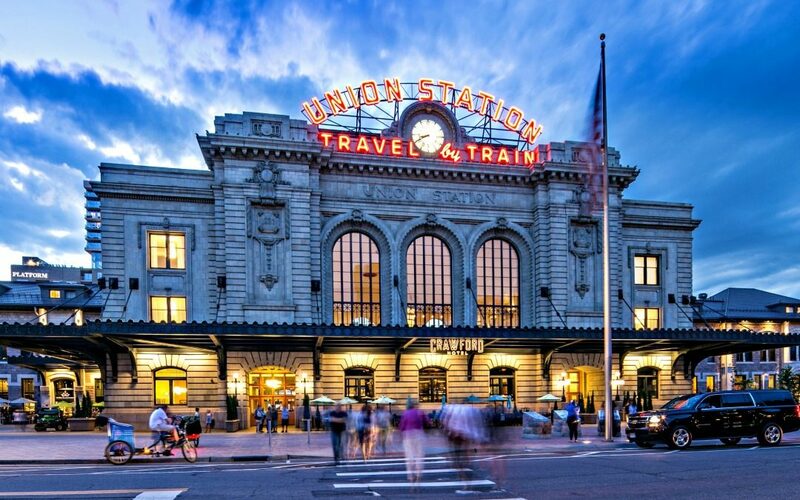 Denver Union Station is a 150 year old icon, the city’s ground transportation hub, and my favorite Denver landmark. I’m enamored by train travel, and Union Station for train enthusiasts is nirvana. It’s simultaneously glamorous and functional. Formal and relaxed. 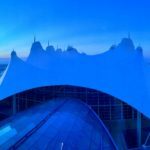 It’s spectacular, and I love the welcoming energy of an atmosphere engaging people who are there for many different reasons, dressed in business suits or flip flops. Travelers and locals. 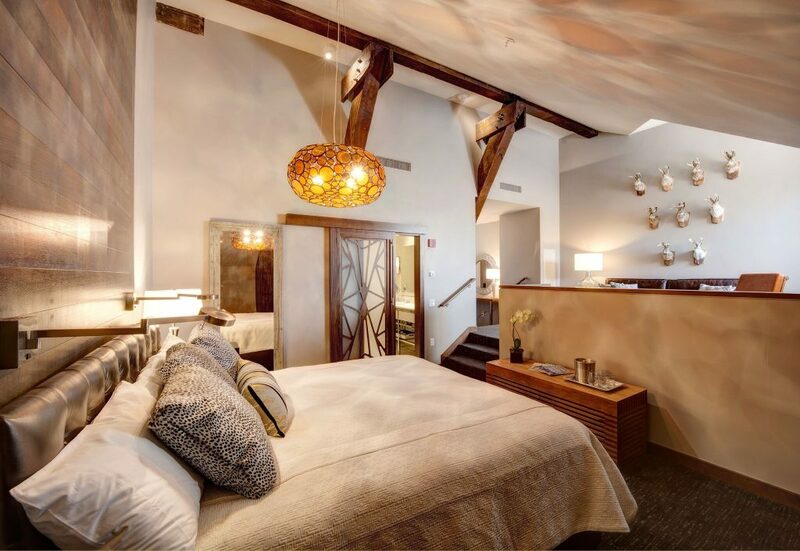 This gorgeous space works on multiple levels. They say without train travel, Denver may not even exist today. 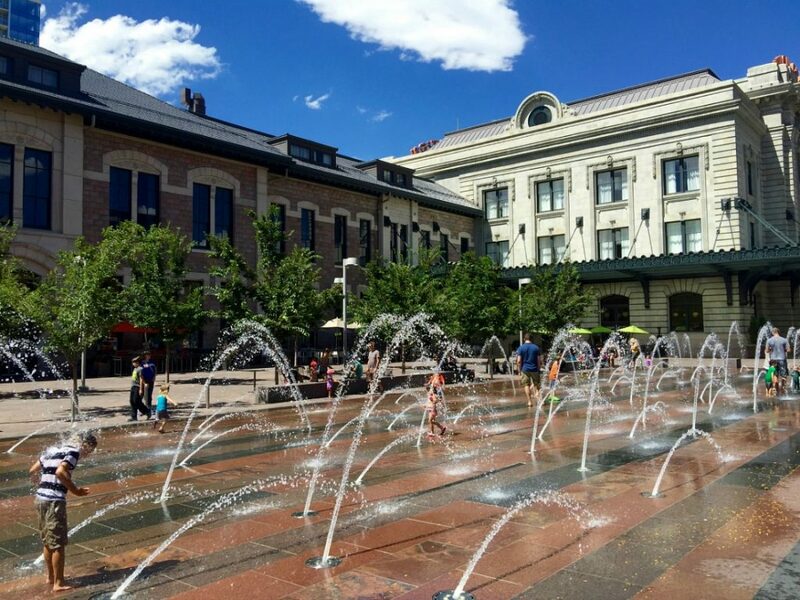 In the 1800’s when railroad officials planned to exclude the city with westward rail expansion through Cheyenne, Wyoming, some smart city planners stepped in and constructed a line connecting to the Cheyenne route, ensuring Denver got a piece of the action. 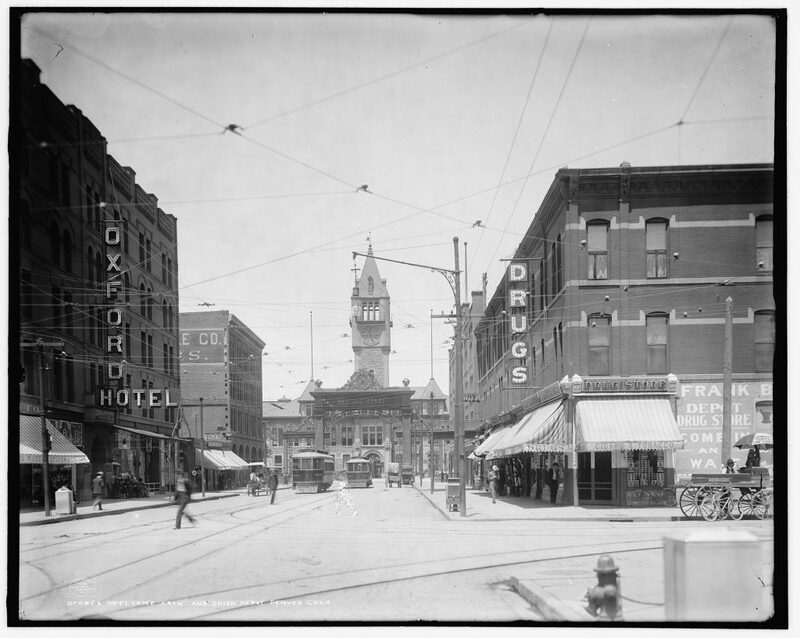 During the heyday between 1865-1968, train travel through Denver boomed. The first Union Station opened in 1881. A fire destroyed the building in 1894, but it was promptly rebuilt. At one point it had a 65 ft. arch, and at another, a tower. 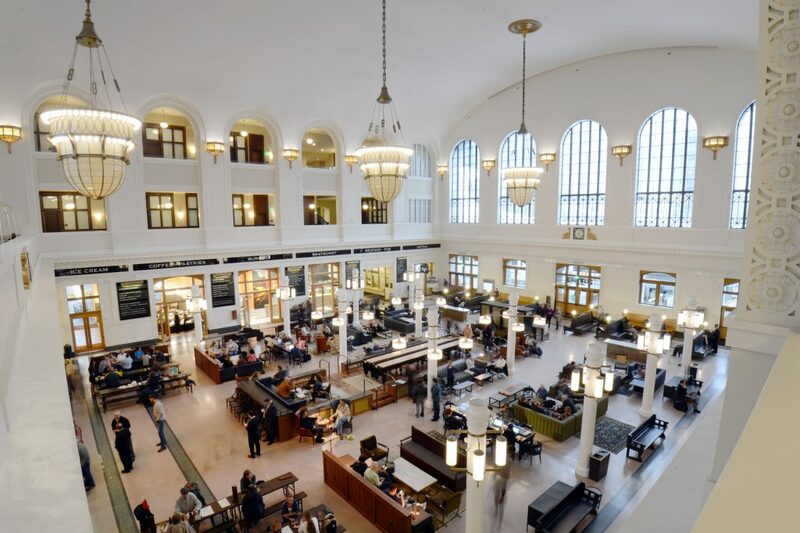 Denver Union Station went through several incarnations before becoming the magnificent structure it is today. During the 1920’s-30’s Union Station was operating about 80 trains per day. Among passengers were presidents and WWI and II soldiers. After the WWII, this mode of transport declined. In the late 50’s, the “travel by train” signs were installed on the building to promote intercity rail travel. By the 1960’s train travel was essentially abandoned for car and air travel. And for a while, the future of train travel looked bleak. Thankfully, by 2014, the landmark was resurrected to full glory in a restoration project that cost over $500M. The original Union Station built in the 1800’s cost $525K, to give you some perspective. Mad props to those who were able to envision this and see it to fruition. If only every city could have their own community friendly train station like this, all connecting to one another. Union Station should be required research for every city planner out there. Design-wise, I don’t think it could be more perfect. Giant chandeliers recreated from photos of the originals are absolutely spellbinding, and the archways and 28ft. cast iron windows lined with thousands of Columbine flowers give a nod to the state flower. I’ve been to Union Station on two different trips and cannot get enough. 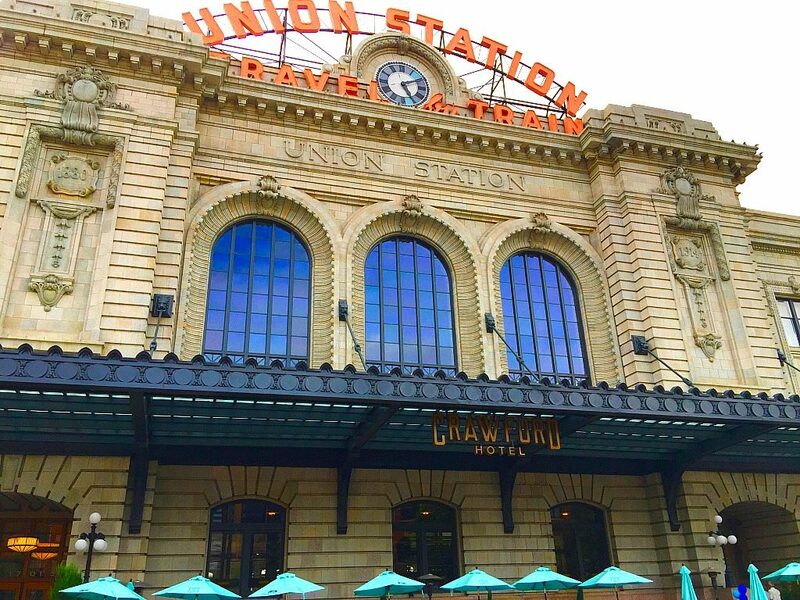 My second trip involved a stay at The Crawford, and I literally barely left Union Station for two whole days. 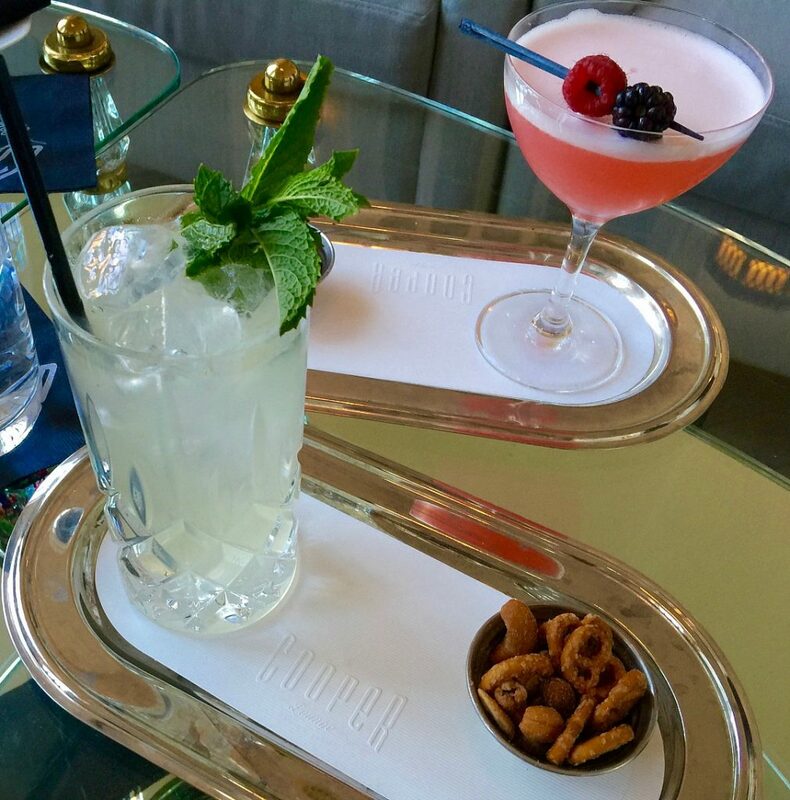 There is plenty to do and I just wanted to marinate in the fabulous atmosphere. 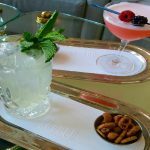 The Crawford is one of my all-time favorite hotels. It feels like a step back in time, but also modern and quirky. 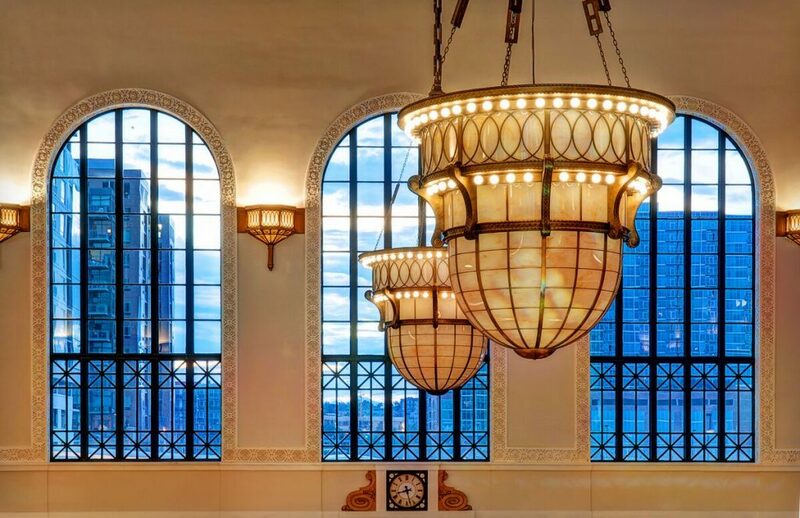 The hotel pays great homage to a bygone era, while simultaneously reawakening the best of that world with wonderful design and immediate access to Great Hall and easy train travel. Union Station is teeming with life. It’s an fertile workspace with plenty of caffeine available. While I was there I saw many meetings take place as well as students and business people being productive on their laptops. I got a ton of work done while there myself, fecundity is in the air. Apart from wired work stations and spacious tables, there are tons of seating options from lovely leather wing back chairs to benches and comfortable gray sofas. 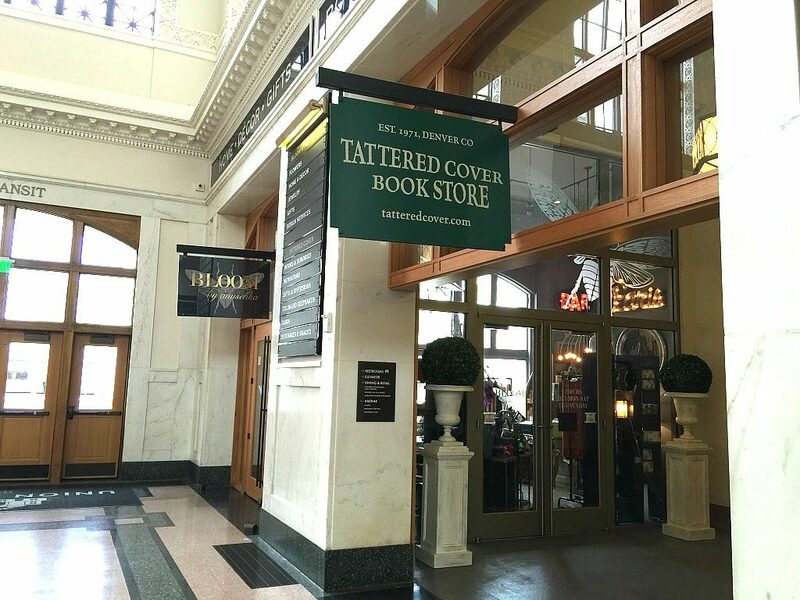 From the Denver institution Tattered Cover to cool boutiques like Bloom, you can do a little shopping right there in Union Station and find unique things to take home as gifts like beautiful jewelry from Bloom and souvenirs like a coffee mug from PigTrain or Snooze T-shirt with the Colorado flag. 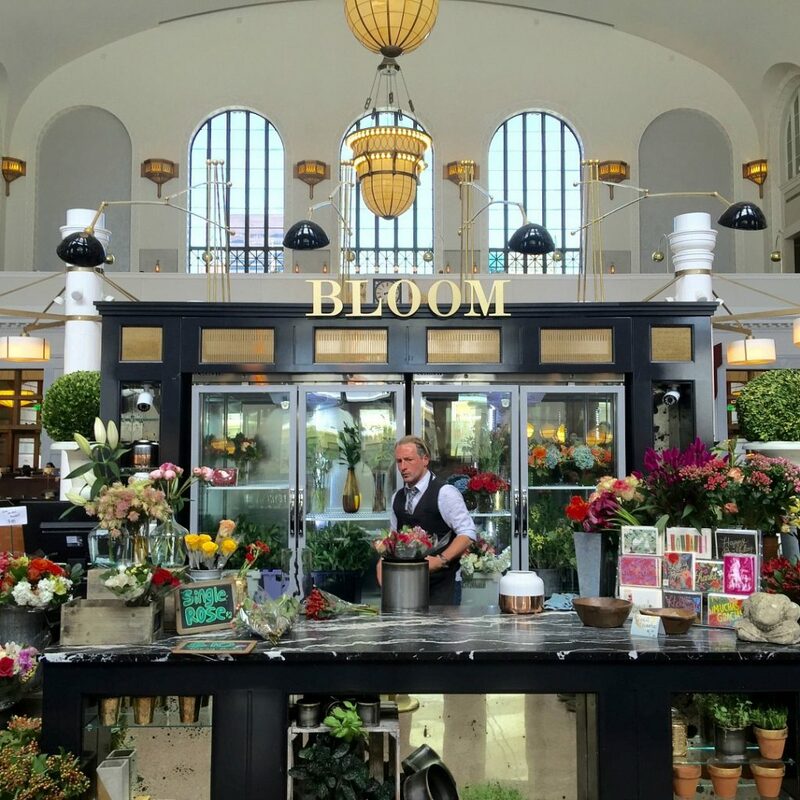 Bloom also has a flower shop located in the middle of Great Hall. It’s a bright splash of bold color in the middle of a largely black and white space. It pops. Next to Bloom is a concession stand that offers fresh cold pressed green drinks for all you fellow green juice addicts out there. 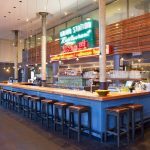 A variety of excellent food options in Union Station offer something to please any palette. You can get fresh pressed fruit, vegetable and green juice at Mercantile, along with other farm to fork foods and creatively prepared gourmet dinners. 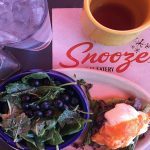 You can brunch it up at Snooze AM Eatery (my son’s favorite), or get swanky at The Cooper Lounge with craft cocktails and views of Grand Hall below. 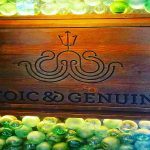 Stoic & Genuine offers fresh seafood, and The Kitchen Next Door has delicious burgers (veggie too). And if you just need to get good and caffeinated to get some work done, PigTrain serves organic, fair trade coffee. 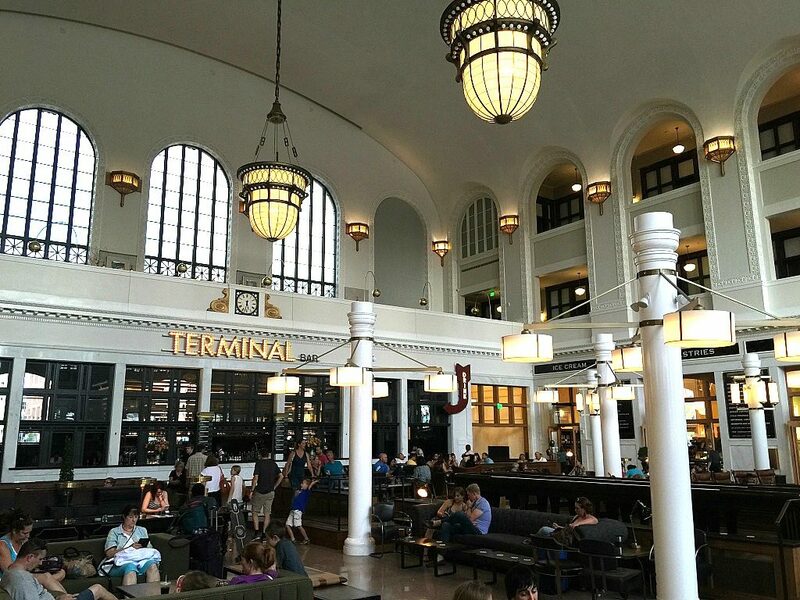 It was genius to turn the old ticket counter into the Terminal Bar which serves local Colorado craft beer and cocktails and pub style food that comes from Acme Delicatessen, also located in Great Hall. Terminal Bar has the pucks that go with the table shuffleboard in the center of the building. Denver Union Station is family friendly. With a fun spray park water fountain in front with 300 jets of cooling water to run through, and an old fashioned ice cream parlor. My son loved his time at Union Station. Transportation is a cinch now that the new RTD (Regional Transportation District) Light Rail from Denver International Airport is running. 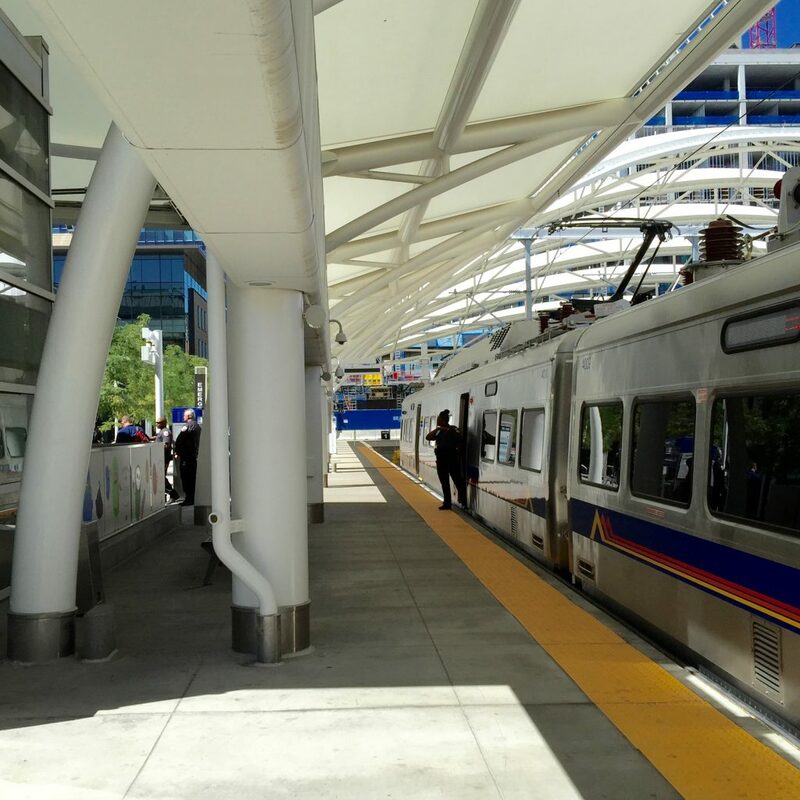 It’s $9 for adults and $4.50 for kids to ride the light rail from DIA directly to Union Station. It’s a pleasant 43 minute ride. Below Denver Union Station is the bus terminal, with cheery yellow subway tiles. Once you’re at Union Station, it’s super easy to connect to other parts of the city and beyond. 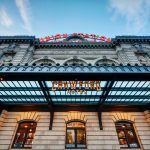 Union Station is my number one pick for where to go and what to do in Denver. 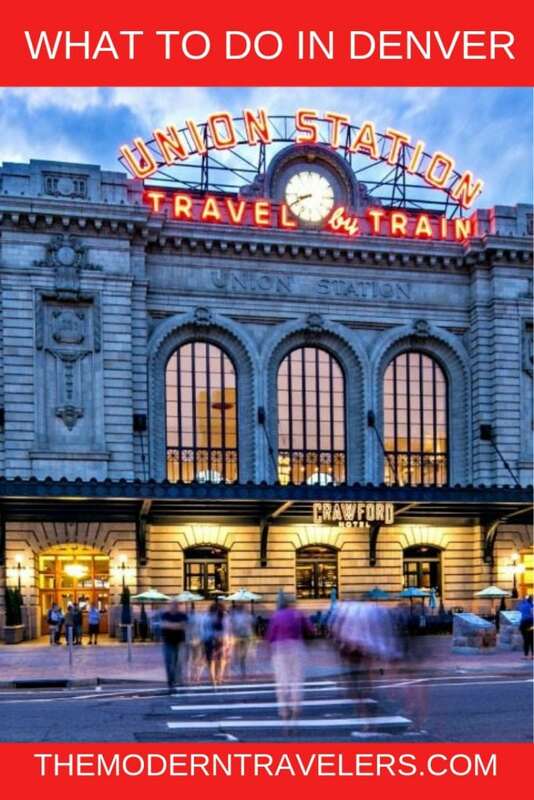 I have a million more and it’s a city with endless wonders, but if you could only do one thing, I would say visit Denver Union Station. And if you are a train aficionado like me, it’s worth a trip just to stay at The Crawford and bask in the awesomeness that is Union Station. 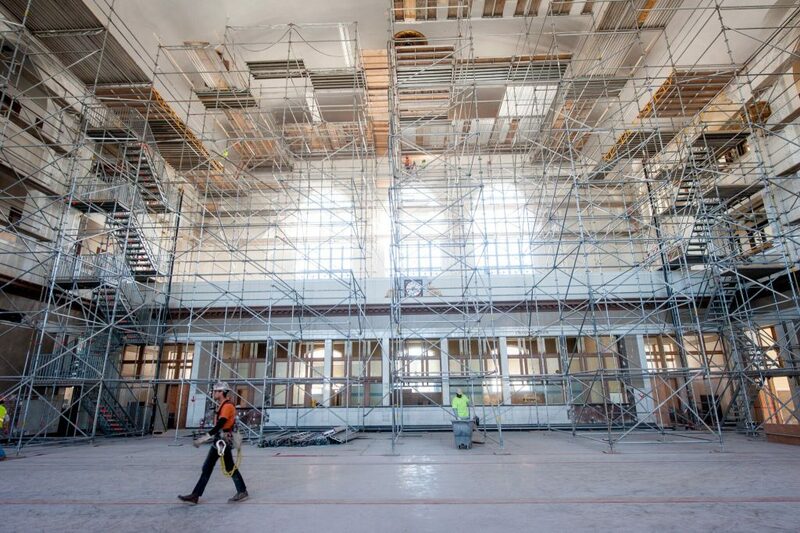 Find out more on the Union Station website HERE. 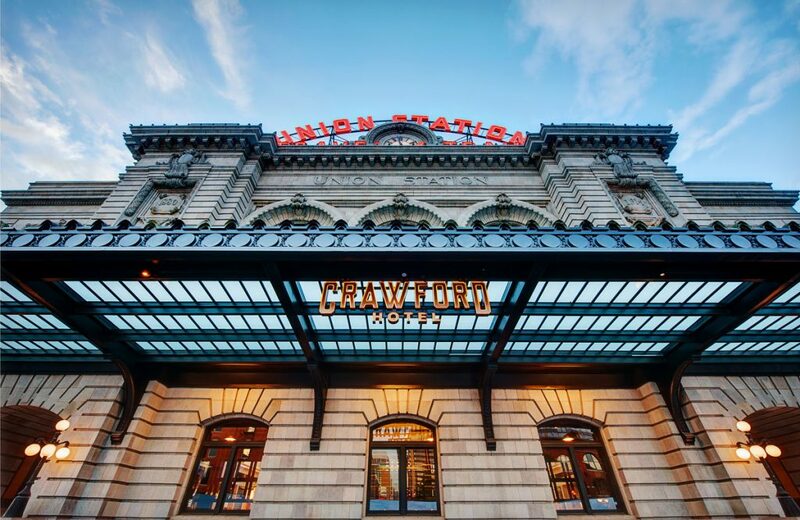 Images 1, 2, 5, 7 are courtesy of Denver Union Station/The Crawford Hotel. Thank you David! I love train stations too, and train travel is my favorite mode of travel. Some day I’d love to experience the Orient Express!